I’m with you, Heather – as you say, it’s about the appropriateness of what is set and the skills which can usefully be practised and reinforced, not the fact that it’s done at home. 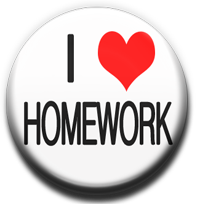 I think homework teaches older students a valuable life skill, too, in that they have to be disciplined, motivated, organised and reasonable in their expectations of themselves – independent, in fact. If a fair proportion of our students are going to move into careers where the work isn’t finished when they leave the building for the day, then deciding on how much work to do in their own time – which includes making sure they don’t spend too much time working and thinking about work so that they neglect the other important elements of their life – is important. Homework helps them to start to get their head round this, and they should continue to build these skills if they continue their studies beyond school. I didn’t see reading nightly with my kids as ‘homework’, as it’s not really ‘work’ but more a habit from birth and something that many parents do long before their child starts school. I think I would have felt a bit affronted to have this activity set by school as a ‘homework’. Could I ask why your school year is only 33 weeks – are you teaching overseas?